NAIROBI, Kenya, May 25, 2016 (ENS) – The United Nations, backed by celebrities from throughout the world, today launched an unprecedented campaign against the illegal trade in wildlife. This killing is pushing species to the brink of extinction, robbing countries of their natural heritage and profiting international criminal networks. #WildforLife, launched today at the second United Nations Environment Assembly (UNEA-2) in Nairobi before environment ministers from every corner of the planet, aims to mobilize millions of people to make commitments and take action to end the illegal trade. The campaign is run by the United Nations Environment Programme, UNEP, the UN Development Programme, the UN Office on Drugs and Crime, and the Convention on International Trade in Endangered Species, CITES. Funders Global Environment Facility and World Bank are on board as supporters. UNEP Goodwill Ambassadors are lending their well-known names to the cause. 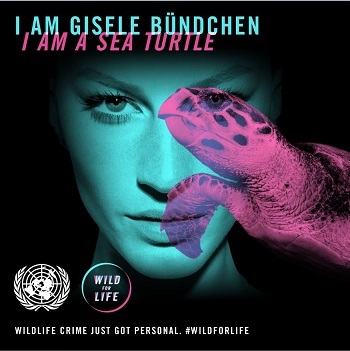 Brazilian model and UNEP Goodwill Ambassador Gisele Bündchen is fighting for sea turtles. Nearly all species of sea turtle are classified as Endangered. Slaughtered for their eggs, meat, skin and shells, sea turtles suffer from poaching and over-exploitation, habitat destruction and accidental capture in fishing gear. Climate change degrades turtle nesting sites. “Knowledge is power and now is the time to set our minds to ending all illegal wildlife trade before the choice is no longer in our hands. Today, I am giving my name to change the game for sea turtles,” Bündchen said. Vietnamese pop singer Thu Minh hopes to save the rhinos. Three rhinos are killed every day, and the Western Black Rhino has already gone extinct. 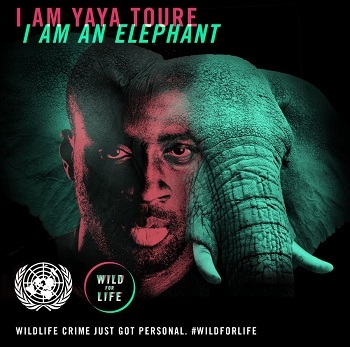 The beleaguered elephants have two champions: Chinese actress and UNEP Goodwill Ambassador Li Bingbing; and four-time African Footballer of the Year Yaya Touré who plays for Manchester City and hails from the Ivory Coast. Between 2010 and 2012, 100,000 African elephants were killed for their ivory. U.S. actor and UNEP Goodwill Ambassador Ian Somerhalder (who played in Vampire Diaries and Lost), is rooting for pangolins, also called scaly anteaters, the most illegally trafficked mammal in the world. His wife, Nikki Reed, U.S. actress, screenwriter, singer-songwriter, and model, best known for her portrayal of vampire Rosalie Hale in “The Twilight Saga,” is the only celebrity, so far, to work for the survival of a plant – the Rosewood tree. Rosewoods everywhere are threatened by overexploitation. They are prized for guitars and other musical instruments, billiard cues, fountain pens, chess sets, handles, furniture and luxury flooring. The campaign asks participants to find their kindred species and use their own spheres of influence to end the illegal trade. Bahraini-Sri Lankan actress Jacqueline Fernandez is working for the survival of the tiger and asking others to join her, while Nadya Hutagalung, the Indonesian-Australian model and Great Apes Survival Partnership Ambassador, is working to save the Orangutan. All these well-known people are calling for citizen support to end the demand that is driving the illegal trade. Profits from the illegal wildlife trade often go to international criminal networks, threatening peace and security and damaging the livelihoods of local communities who depend on tourists attracted by opportunities fo wildlife viewing. Stopping this trade is key to achieving the new UN Sustainable Development Goals, SDGs, as it threatens biodiversity and people’s livelihoods, and disturbs the peace. SDG 15, in particular, calls for the protection of wild animals and plants as well as the ecosystems they depend on. It sets targets for combating and addressing the supply and demand of illegal wildlife products. Politicians and business leaders will join the celebrities in making pledges to save species during UNEA-2 and in the run-up to World Environment Day June 5, which is themed “Go Wild For Life” to tie in with the campaign. Angola, the global host of World Environment Day, will be making pledges to tackle the illegal ivory trade that day. Steppenwolf’s lead singer, John Kay, has donated the use of the song “Born to Be Wild,” one of the top three international music licenses for Universal Music, to the campaign. Anyone is welcome to join the campaign by visiting www.wildfor.life and using the #Wildforlife hashtag on Twitter to share their kindred animal and pledge.